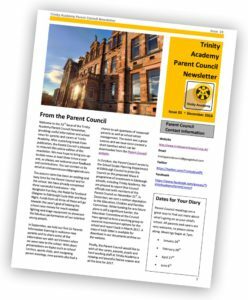 We have just re-launched our regular Parent Council newsletters and hope to bring you up-to-date news at least three times a year and, as always, we welcome your feedback and contributions. This issue features news from the Parent Council, updates on our fundraising and improvements to the school. You can learn more about what’s been happening in school, we have a ‘Q&A’ with one of the teachers and you can read about what’s happened to one of our former pupils since leaving school in 2012. It’s available to download from our documents section. Can I hear a rustle?